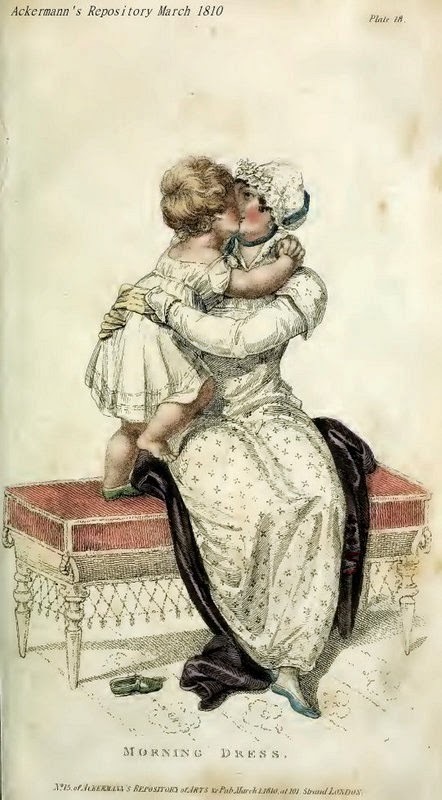 The Marriages, Births, and Deaths sections of magazines can be surprisingly exciting, as the entry from La Belle Assemblée for April 1817 demonstrates. In the Fleet Prison, the lady of Charles Henry Bazeley, Esq. of a daughter. In Chester, the lady of the Rev. Rich. Massie, of a son, being her 20th child. At Preston, the wife of Mr. John Counsel, weaver, was brought to bed of a fine boy and two girls, all of whom are doing well. At St. James’s Church, the Earl of March to Lady Caroline Paget. The bride’s maids were the Ladies Jane and Georgiana Lenox, Ladies Jane and Georgiana Paget. The Marquis of Anglesea gave the lovely bride away. 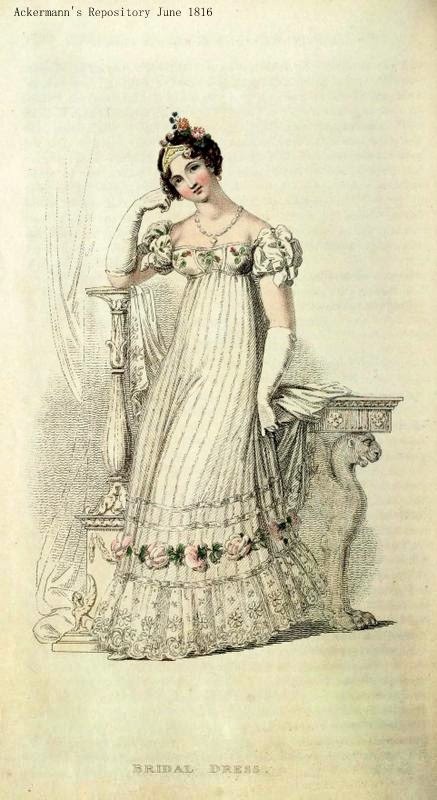 The, bride was elegantly attired in a Moravian worked muslin dress, with robes and trimmings of fine Brussels lace, worn over white satin, with a pelisse of white satin, richly trimmed with lace; her headdress consisted of a cap of entire lace, over which she wore a beautiful white lace veil. Her dress was rich, elegant, and neat. Re-married on their return from Gretna-Green, at the house of her father, at Boulogne-sur-Mer, Captain Somerset, son of Lord Charles Somerset, to Miss Heathcote, daughter of Capt. H. Heathcote, R. N.
Juvenile indiscretion!—At Tarvin, Mr. James Mort, aged 60, to Mrs. Ann Edwards, aged 80, both of great Boughton, near Chester. To avoid suspicion, the bride prevailed upon the bridegroom to go to Tarvin on the evening of Sunday, to which place the disconsolate damsel followed him in mourning, but to the astonishment of her neighbours, she returned in virgin white! This is the third time Hymen’s chains have been rivetted on each of these young rogues. At Whaplode, Lincolnshire, Mr. Sindal, to Miss Favel, of that place. Mr. Sindal had just before come into possession of a considerable sum of money, which induced Miss Favel to marry him, and on the following Sunday night she decamped with a journeyman baker, taking with her 133l. by way of support. So as to keep my blog from going to infinity and beyond, I left off the deaths, but you may want to visit the page, and notice the ages of the deceased. Jane Austen saw a report some time before this of a peer's son marrying a Paget daughter( Don't have my books with me) She said she thought the young man's mother would be opposed to such a marriage and said she hated the race of Pagets. In the years around 1809-1811 various members of the Paget family were in the divorce courts. Adultery seemed a contagious dsiease in that family. I am astonished at the triplets, I understood that until the modern era it was unknown for all three to survive birth. I hope they continued to do well, though sadly statistics are against them. In the deaths column, an engraver was described thus: "Like many other children of Genius he was unfortunate."